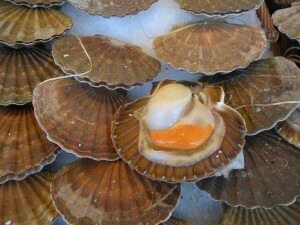 Coquilles St Jacques in the shell were one of the memorable culinary delights at the Bastille farmer's market. I’m not sure if it’s the recent rains or the need for a real vacation adventure, but I’ve been longing for Paris. The last time I visited the city of Light was in April 2009 and it was perfect. Rainy and sunny at turns, full of surprises and new discoveries. Since I don’t have a plane ticket, I thought I’d take a little vacation of the mind by reliving some of my favorite images from the trip. I was groggy from a night spent dozing in coach as a new friend helped me navigate the Metro and dump my overpacked suitcase at the hotel. Then we went in search of breakfast and spotted the peaks of white canopies off in the distance. We walked towards them and this is what we discovered at the Sunday morning Bastille Farmer’s Market. Nice article. I am taking my daughter to Paris and to Avignon at the end of May. Any suggestions of must do’s in the eating/drinking world? I already have arranged for a private tour of Ch. Beaucastel.